Call 780 395 0840 or email sprucegr@briteviewglass.com for your quote! Brite-View Glass offers automotive, residential and commercial glass manufacturing and custom cutting services to Spruce Grove and Stony Plain residents. Since 2001, Brite-View Glass has been a leader in Spruce Grove glass repair, providing a full range of auto, residential and commercial glass services from two convenient Edmonton locations – south side at 8714 – 51 Avenue and on the north end at 14209 – 130 Avenue. We’ve built a reputation for integrity,convenience and quality by offering superior products, expertly installed to the highest professional standards. We also offer a mobile service to your home or business and a shuttle for pick up and drop off anywhere in Spruce Grove. We are proud to serve Leduc, Nisku, Beaumont, Devon, Sherwood Park, Stony Plain, Fort Saskatchewan, St. Albert and everywhere in between. Brite-View Glass also manufactures and custom cuts mirrors, glass shelving units, table tops, shower doors, interior glass walls, privacy glass and more. Everything we do is backed by industry-leading warranties and our personal commitment to excellent customer service. 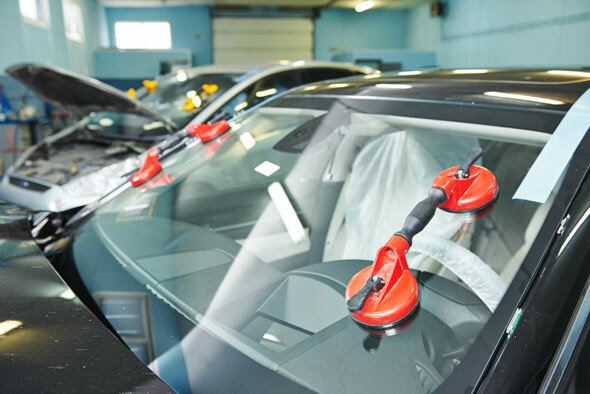 Our Spruce Grove windshield repair and automotive glass services are performed by a team of fully trained professionals using only the highest quality parts, expertly installed to the highest standards. Quality products require a slightly larger up front investment but are much more cost-effective in the long run as they are safer, more reliable and longer lasting, with superior transparency and fewer flaws or distortions. Brite-View Glass has earned a reputation for being Spruce Grove’s best choice for windshield repairs and replacements. From repairing a chipped windshield to complete replacement of any window on your vehicle, we offer fast, convenient automotive glass services in Spruce Grove. We use only quality parts installed by glass experts. Brite-View Glass promises convenient, competitively priced and reliable windshield replacement in Spruce Grove and Stony Plain. Trust Brite-View Glass to help make your Spruce Grove home secure and protect it from the elements. We use only the highest quality products and our experts know how to properly install and seal windows and doors to keep you cozy, warm and safe. All of our Spruce Grove residential glass services are backed by industry-leading warranties and Brite-View Glass will work with your insurance company to help resolve claims. For honesty, integrity and professional service, choose Brite-View Glass for your Spruce Grove home. Damaged and broken glass doesn’t just look bad for a business; it’s a dangerous liability to both customers and liabilities, and it needs to be repaired quickly and expertly. That’s why we offer prompt emergency glass repair services, and work to help make insurance claims as easy as possible, plus back all of our work with our industry leading warranties. Broken and damaged glass doesn’t just make your store front look bad, it can be a liability to your company and threatens the security of your employees, your clients and your entire Spruce Grove business. Brite-View Glass knows how critical it is to have properly installed and sealed glass to keep your business safe and protected from the elements. Brite-View’s professionals will expertly repair and replace broken or cracked glass doors and exterior glass walls, plus we will work with your insurance company to help resolve any claims. All of our commercial glass work in Spruce Grove is backed by industry-leading warranties. For quality products and expert glass installations in Spruce Grove or Stony Plain, trust your commercial and industrial glass needs to Brite-View Glass. Our commercial glass services include: complete installation of exterior and interior glass for your new business in Nisku or Leduc; complete repair and replacement of exterior windows and glass doors on existing businesses; custom glass cutting in any size and shape to your exact specifications; custom built glass storage units, showcases, shelving, interior walls and mirrors. Custom glass for Leduc businesses is available in clear, tempered, textured, tinted, bevelled or patterned styles. Glass desk tops, table tops, and bevelled mirrors are just a few of the custom services Brite-View Glass in Spruce Grove can provide. Our custom glass specialists can cut glass to precise specifications for virtually any application, complete with decorative edging when requested, and all of our custom glass is backed by our industry-leading warranties. Brite-View Glass is pleased to be your best choice for custom glass manufacturing and cutting in Spruce Grove Oddly-shaped windows, bevelled mirrors, showcases, shelving, table and desk tops, shower doors, interior walls and office doors, our team of experts can cut glass to your precise specifications, with no limits on size or shape. Glass is available in a variety of styles: clear, textured, patterned, tempered and tinted. Individual pieces can be finished with custom edging, including mitred, chamfered, bevelled, ogee and waterfall. Then we’ll install it with the same courteous professionalism and expertise you’ve come to expect from the glass experts in Spruce Grove and Stony Plain.